Several types of aircraft are named after the toucan. Many indigenous peoples consider toucans as conduits between the living and the spirit worlds. 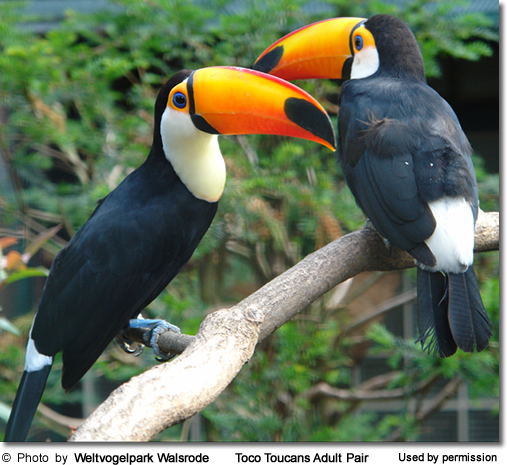 Ecological Importance: Toucans serve an important ecological role as they disperse the seeds of the fruit consumed. Wings are relatively small, suitable only for short distance flights. ... can be solid black, blue, brown, green, red, white, yellow, or can be colored patterns. ... are not strong enough to bite or destroy objects. ... Red Breasted Toucan has the smallest bill of the large toucans and is commonly seen in the rain forests of Brazil and Argentina. This writer once observed one flying overhead on the Brazilian side of Foz de Iguacu. 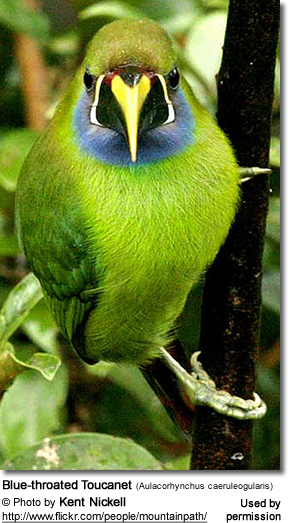 Bright plumage serves as camouflage in the colorful rain forest canopies. Body length ranges from the smallest species at 7 inches to over 2 feet. Size: Red Bill Toucan and Swainson Toucan tie for second place behind Toco Toucan for size, and are only slightly smaller. Tails vary in length from equalling half the length to the whole length of the body, according to species. Predators include humans, large birds of prey and wild cats, particularly jaguars. Nest Predation: Eggs and nestlings are subject to plunder by all sorts of animals, especially snakes and other birds. 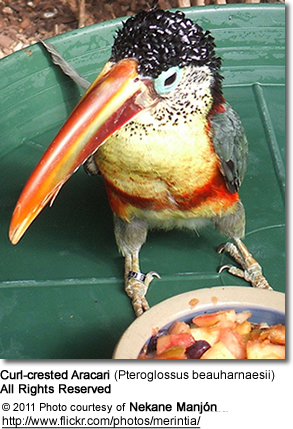 Lifespan: Toucans can live 12-20 years, depending upon species; larger toucans have lived up to 25 years in captivity. Toucans are very intelligent and trainable, and can even be trained to go potty only in their cages.They are friendly and playful. Toucans were first successfully bred in captivity in the United States in 1977.All large black toucan species have been in captivity in the United States at one time or another.Today the Yellow Ridged and Black Mandible are absent from US collections, with the Red Breasted and the Ariel being quite rare.